A monochromatic version of this image. 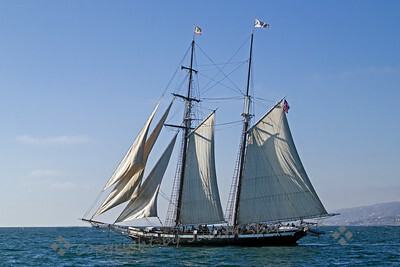 Tall Ships Festival, Dana Point, CA. 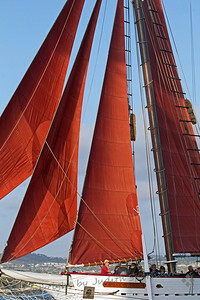 This graceful sloop, the Curlew, was part of the Tall Ships Festival. 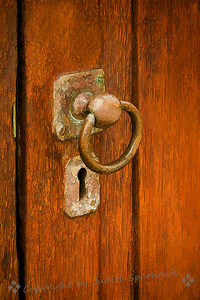 This lock and door pull were on a little door on one of the ships at the Tall Ships Festival. 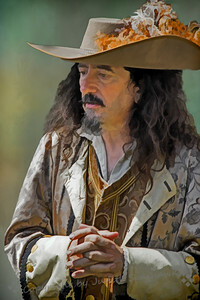 I liked the look of it, and added some painterly and texture effects. 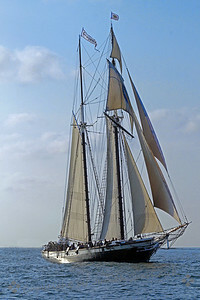 One of the ships in the Tall Ships Festival. 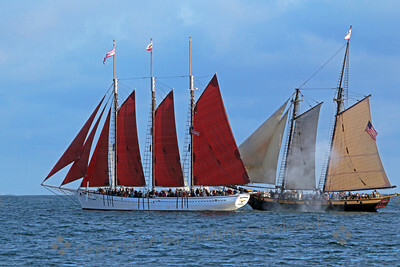 After last visiting the Tall Ships Festival 5 years ago, I made a second visit last weekend. 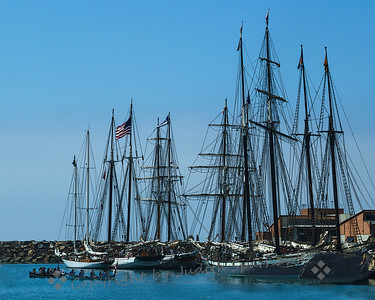 This is a view of the tall ship fleet moored at the dock, ready for visitors. 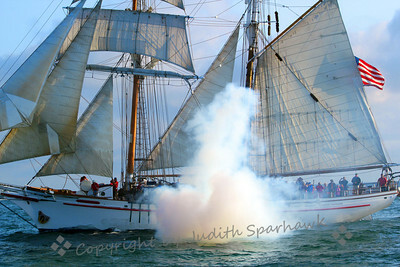 Later they went out from shore, raised the sails, and participated in mock cannon battles. 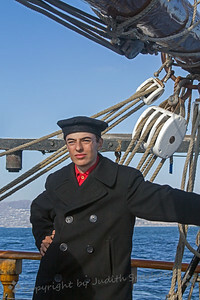 The small boats to the left hold costumed pirates coming to shore for some skullduggery. No photographers were harmed in this event! 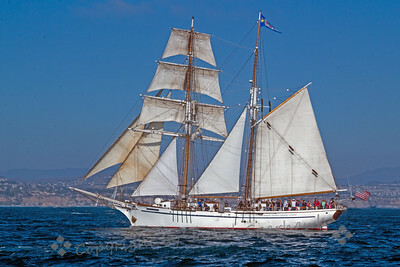 Another ship in the Tall Ships Festival, heading out for battle. 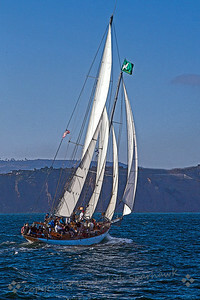 This lovely figurehead was on the Spirit of Dana Point, at the Tall Ships Festival in Dana Point, CA. 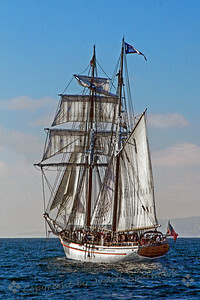 A different view of the ship California. 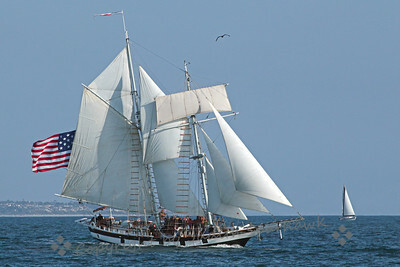 It was out off the coast at Dana Point for the mock cannon battles with the other tall ships. 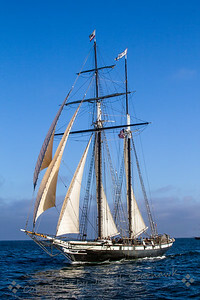 This was one of the ships at the Tall Ships Festival in Dana Point, CA. 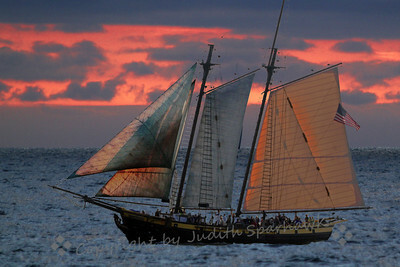 As the sun lowered in the sky, the sea sparkled with gold and lit up the ships' sails. 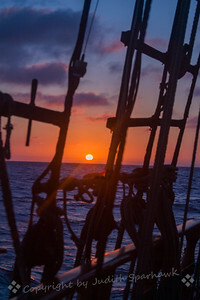 While out on the ship at the Tall Ships Festival, the sun set, and I liked the look of it through the rigging of the ship. 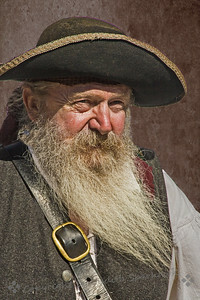 This gentleman was costumed as a pirate at the Tall Ships Festival. 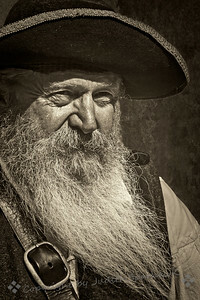 I liked the windswept look of his beard. 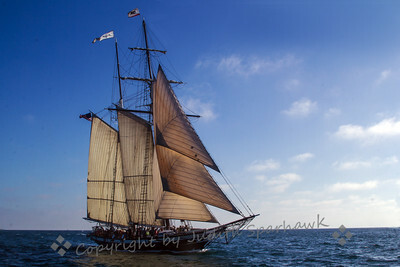 This is a re-do of the Amazing Grace, nearing sunset at the Tall Ships Festival in Dana Point, California. 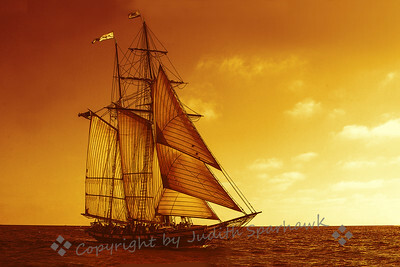 Reworking of an older photograph, using Topaz to give it a more painterly look. 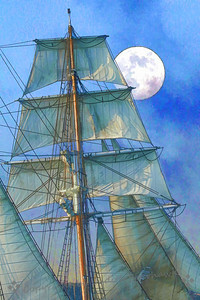 Curlew & the Moon ~ The almost-full moon rose, and made a beautiful accompaniment with the ships sailing offshore. 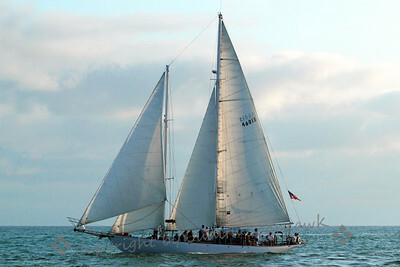 This ship is named the Curlew. 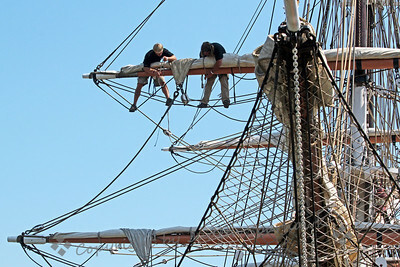 Crew in the Rigging ~ High in the rigging on this ship, two crew members prepare the sails. 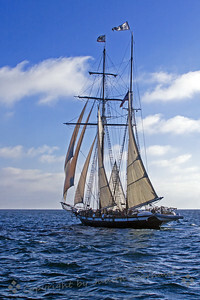 The California, one of the tall ships on the late afternoon cruise at Dana Point, California. 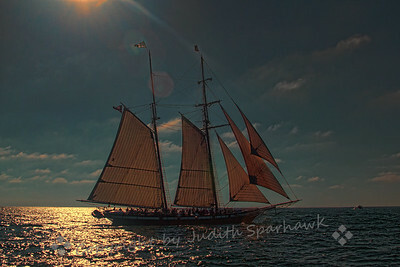 ~ Another view of this beautiful ship. 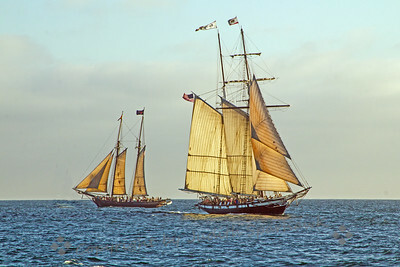 Tall Ships Festival, Dana Point, CA. 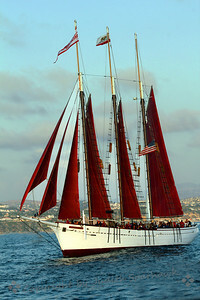 Red Sails Furled ~ This photo was from the Tall Ships Festival in Dana Point, of the ship American Pride. 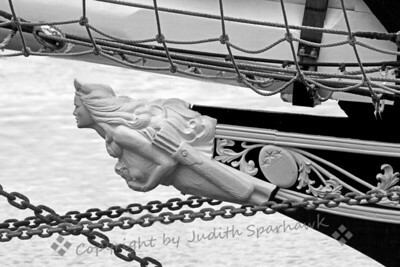 Figurehead in Black and White ~ I was very attracted to the figurehead on this ship, and decided to try it out in black and white for a more dramatic effect. 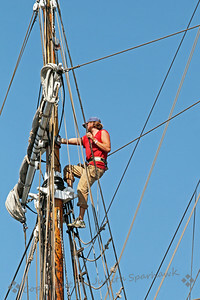 Climbing in the Rigging ~ Before we went out to sea, this brave and agile young man was up in the rigging of one of the ships, preparing to sail. Sunset Sail ~ Toward the end the sail, the sun set, and finished with a nice afterglow, as the ships prepared for a return to the harbor. 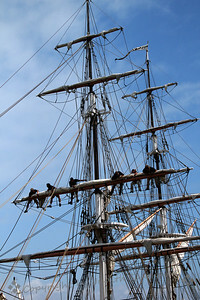 ~ High on one of the masts of the Brig Pilgrim, six workers were preparing the sails. 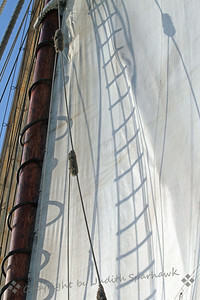 ~ After our sails were up, the various lines, rings and rope ladders made wonderful shadows on the sails. 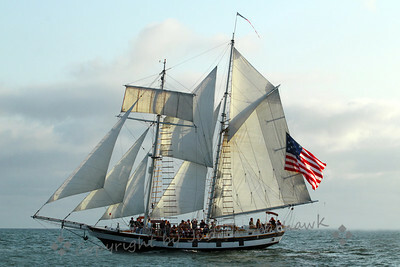 Bill of Rights, Tall Ships Festival, Dana Point, CA. 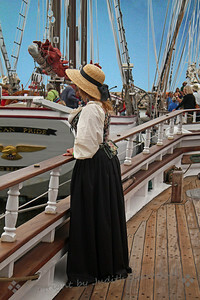 Looking Overboard ~ As part of the Tall Ships Festival, many people were dressed in period costumes. 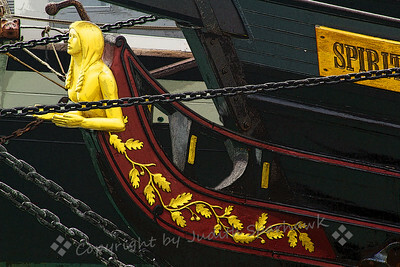 I liked the look of this young woman at the ship's rail, as if looking out to sea. 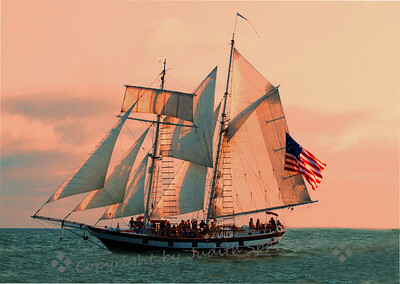 American Pride ~ The tall ship with red sails was called the American Pride, and it made a handsome showing among the other ships. 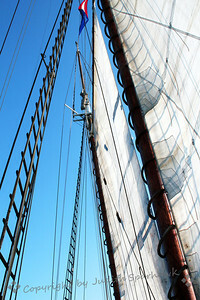 ~ Our schooner had very complicated rigging and sails. I loved the lines, patterns and diagonals. ~ Lots of loud booms from the cannons, lots of smoke, and passengers shouting "Argh" in true pirate tradition--what a way to spend an afternoon! 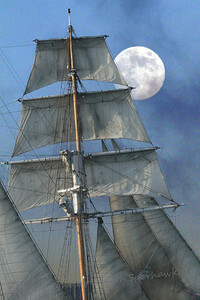 Moon in the Sails ~This image was selected as Photo of the Day by Imaging-Resources.com for 2/9/12. 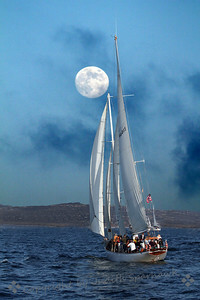 Although I believe the really full moon was the following day, when the moon rose during the sail, it made a striking contrast with the sailing vessels around us. 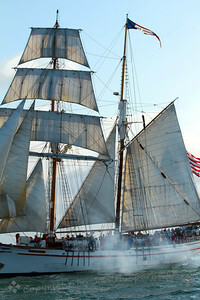 Tall Ships in Battle ~ This ship was in the midst of battle with the schooner, Bill of Rights, on which I was sailing. 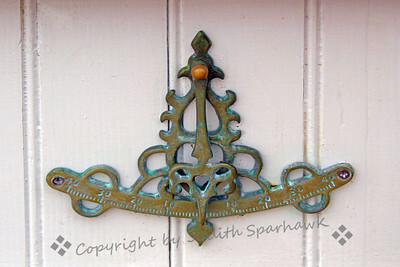 Ship Brass Detail ~ I must admit I am a bit of a landlubber, and can't really name most of the instruments or ship details. 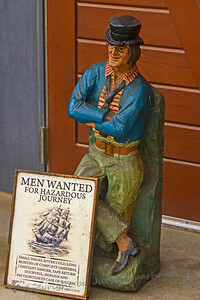 I was still intrigued by what I saw, and enjoyed the feel of very old and unique items. 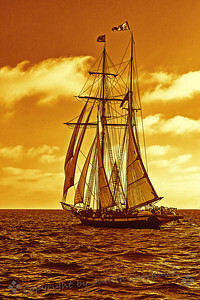 ~ This particular ship had wood posts at several locations, with ropes wrapped around them. 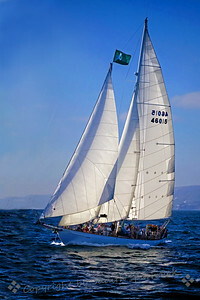 I'm sure they have great nautical names, but I don't know them. 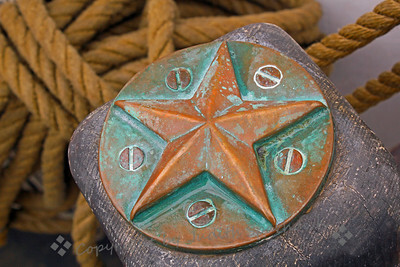 They had these brass stars on the tops of the posts.